“Quest for Democracy” (Q4D). Q4D is a grassroots expression of formerly incarcerated people’s ability to speak for themselves. 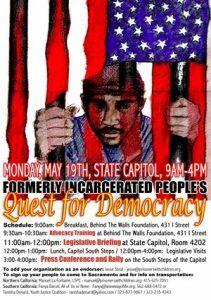 The May 19th Lobby Day is supported by formerly incarcerated people, friends, family, and concerned people from all over California who come to Sacramento to bring their unique and often absent voice. No-Cost Bus transportation, Food, and Refreshments are provided. If you or someone you know would like to go, PLEASE CLICK HERE TO RSVP!